The 30th Annual Redlands Bicycle Classic presented by San Manuel band of Mission Indians shifted gears today. The riders left the mountains behind and headed back to downtown Redlands for the Saturday Men’s and Women’s Criterium. 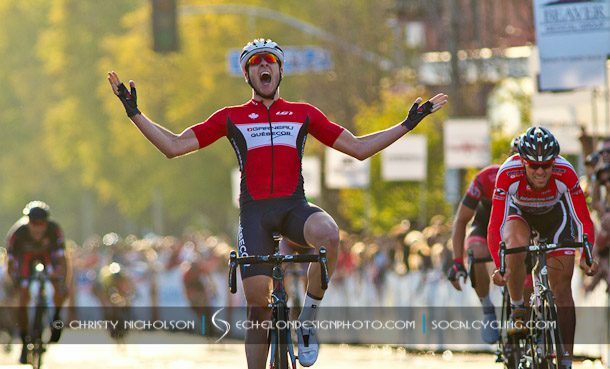 Today’s criterium action was a chance for riders to pick up much needed time bonuses and a coveted stage victory. Additionally, teams were looking to protect their respective yellow jersey. Controlling the peloton was the order of the day much of the afternoon in the Men’s race. The Smart Stop team controlled the front, while a group of 9 got up the road and created gaps in excess of 40 seconds. With less than 6 laps to go in the race a few teams came to the front to set up the sprint, but the chase never caught the break and the move to get in the break paid off. The eventual winner Pierrick Naud (Garneau Quebecor) survived the chase and went on to win the stage, Bobby Lea (SoCalCycling.com/Craig Shelly) took 2nd followed by Eloy Teruel (Team Jamis Hagens Berman P/B Sutter Home). The GC saw no changes to the top three. Travis McCabe (Smart Stop) looks up for a big challenge tomorrow as Tom Zirbel and William Routley of Optum p/b Kelly Benefit Strategies remain within 6 seconds of the yellow jersey. The Men’s race top ten riders are separated by only 22 seconds going into tomorrow’s final stage on the Redlands Bicycle Classic. The Beaver Medical Group Sunset Road Race begins at 1:30 for Men and 10:00 am for Women. Above Photos – Pierrick Naud (Garneau Quebecor) wins the Redlands Bicycle Classic Downtown Criterium followed by Bobby Lea (SoCalCycling.com / Craig Shelly).